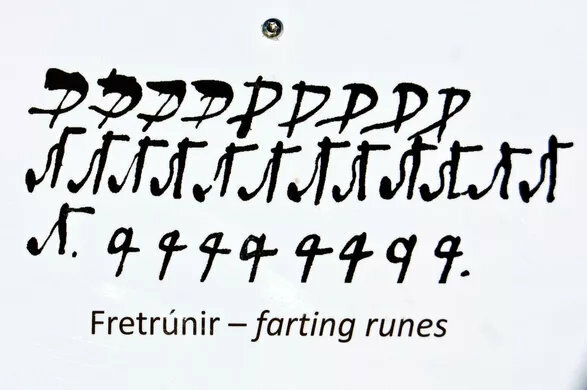 So I am assuming that you then work results magic with runes or galdirstaffir? The gifting cycle doesn’t flow one way. When we give them gifts they return them as well. Even if it’s giving them an offering to petition their aid. You do what you like. I don’t ask for favors or blessings. Never have. Not going to start now. I think part of it, too, is that Norse magic has the same feel as demonic magic. Many of the practices are very similar, and many of the entities have a similar feel to them. It makes it easier to blend, or at the very least switch, from using one current to the other. He was asking if you use runes in your craft. I suppose I’d ask what’s more odd, Heathens moving towards occult, or the way Lutheranism took over the Nordic countries? I’d agree with anyone saying the eddas are riddles that served multiple purposes led by the elders and druids. Religion wasn’t one of them because it wasn’t even a word, and “Heathen” is a loaded perspective. There was only the way things are, Odin is you, the goetic spirits are the same as they always have been. Whether you use decide to use runes or sigils, or what they ask you to call them is a personal path. That’s my take anyway. By definition our gods(the Norse gods) would be demons to Christians, and because of that there interaction with Christians is entirely different than with there own people(would you be buddies and super nice to your worse enemy?). Actually since the 15th century, Norse magicians have known and accepted the idea that Loki is Lucifer and Thor is Beelzebub and when you want to conjure or interact with any of them, the names are interchangeable. Makes sense to when you think about it. Long story short, do not get caught up in the fact they are called “Demons” by some people. Are there any people here that combine Demonic Magick with Norse Magick? Wodanaz gave his eye for knowledge and he himself was a sorcerer. Lots of people who come back to their ancestral roots are still very much indoctrinated with a judeo-christian worldview and project it unto the pantheon. Wodan is “father”, Loki is “the devil”, Baldr is “jesus”, the same duality bs etc. Wodanaz is very much a trickster god, he’s not your daddy in the sky. Others would call him a “demon”. One man’s terrorist, is another man’s freedom fighter. It’s in the eye of the beholder. I feel like with the “Demon” King I made a pact with, it was a simple trade off. My ancestral Gods I love, need and am grateful to. They are a part of me and my line, through an ancient pact that I feel I need to honor. Loki’s great he teaches the rule of Self-knowledge which is to know yourself regardless of the lies people tell you or the lies you tell yourself. He is a great fundemental in the left hand of norse magick as he did everything himself. He went to the dwarves himself to get the items he wanted crafted and fetched what the aesir wanted as well. Wodanaz gave his eye for knowledge and he himself was a sorcerer. Lots of people who come back to their ancestral roots are still very much indoctrinated with a judeo-christian worldview and project it unto the pantheon. Wodan is “father”, Loki is “the devil”, Baldr is “jesus”, the same duality bs etc. Thank you, this happens so much, drives me nuts! The things Odin is chronicled as doing are far from fluffy or moralistic sky-daddy stuff. Maybe its because Heathens are black magicians and they have the right to work with whatever the hell they wanna work with? At any point in time? Because they have much to teach, and i have much to learn. Growing up as a with strict Catholicism is stifling. Besides. Lucifer has always felt comforting to me. And i have always had dream demons come to me in my deeams.